Welcome to another segment of Emilee likes… Emilee is my teen daughter and she shares a project on the blog once a month. I’m always excited to see what idea she will come up with. She is definitely a girly girl who loves to fix her hair in different ways and has recently been making lots of bows to add to her hair styles. 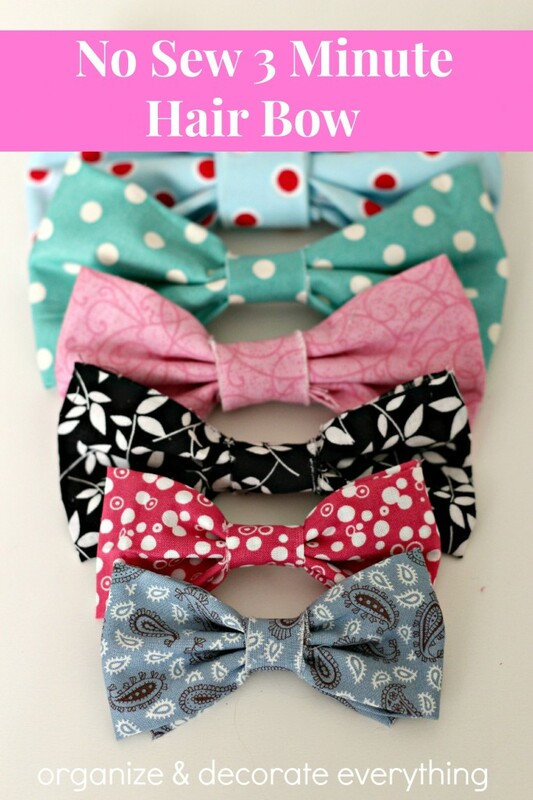 These No Sew 3 Minute Hair Bows are really quick and easy to make using scraps of fabric you might have left over from another project. I have a stash of fat quarters where she was able to choose her fabric. Here’s Emilee to show you how easy they are to make. 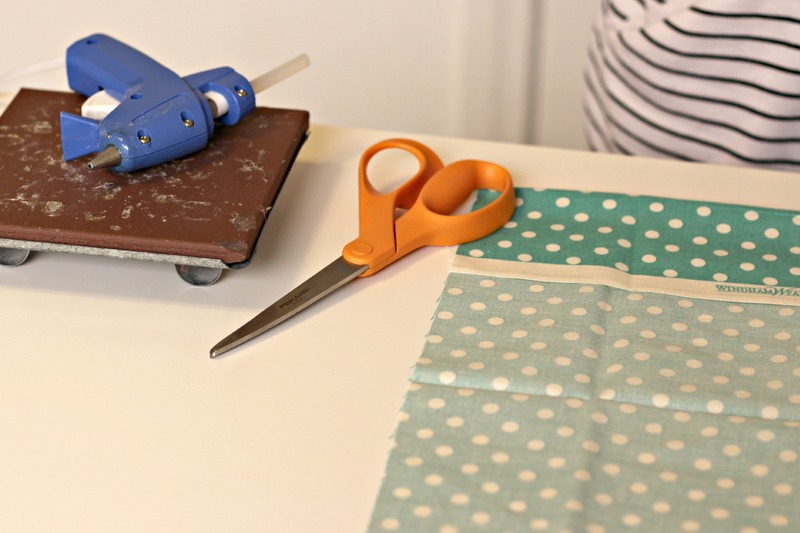 You’ll need a glue gun, scissors, and fabric. For a large bow cut the fabric 6″ x 18″. Open the fabric wrong side up and fold the outside edges to the center. Cut about 1″ off the end to use as the center of the bow. Fold the fabric into thirds by overlapping the fabric so it ends up being 6″ long and 3″ wide. The cut edges are on the inside of the bow. Hot glue the underside of the folded piece so it stays together. Scrunch the bow in the center. 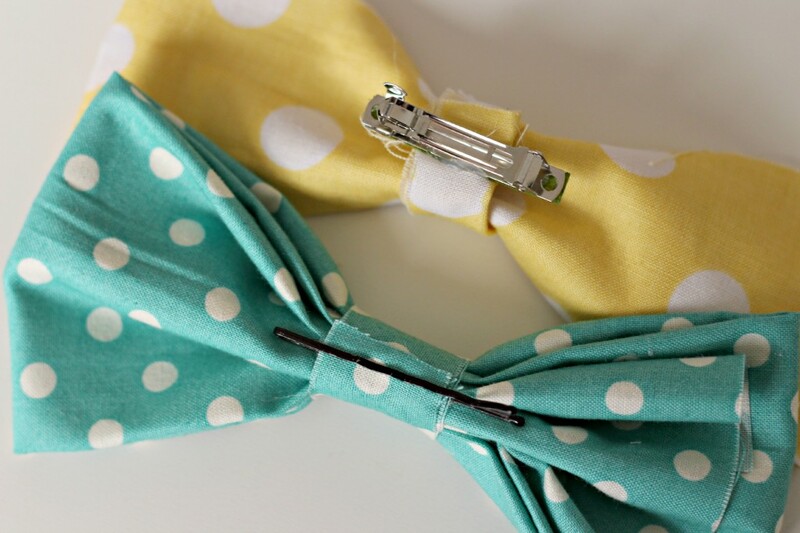 Add the 1″ strip to the center of the bow by starting in the back and wrapping it around the bow. End in the back and hot glue it in place. Cut off any excess so the strip ends in the back of the bow. The large bow measures 3″ x 6″ finished and the small bow measures 2″ x 4″ finished. 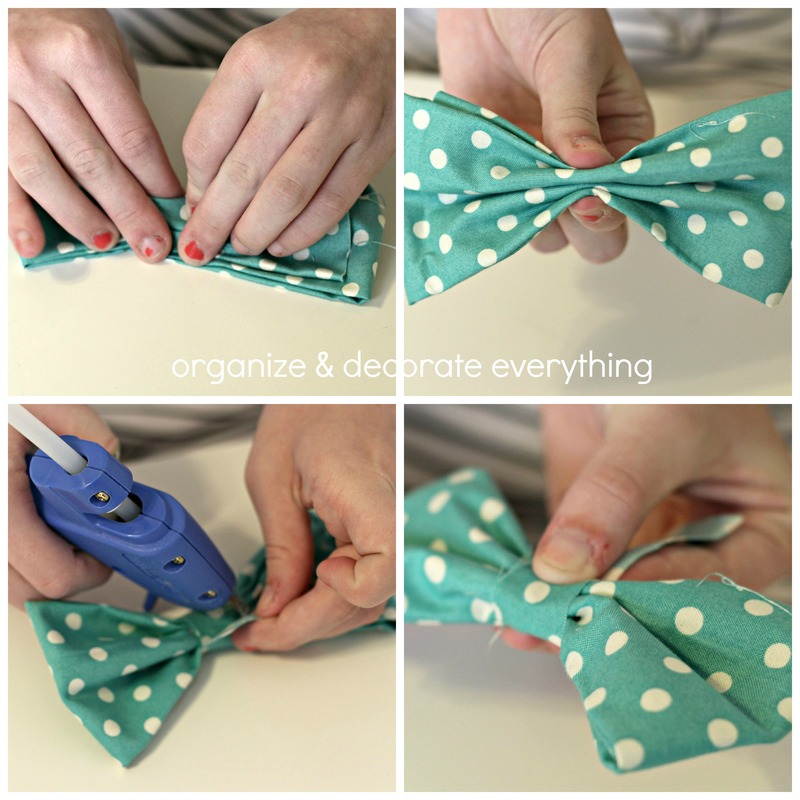 The small bow starts with a 6″ x 12″ piece of fabric and the center strip is a 5/8″ strip. You can hot glue a clip to the back of the bow but a bobby pin works really well if you don’t have any clips. After Emilee made these bows she was on a roll and made about 4 more. I think they turned out so cute and fit her style so well. 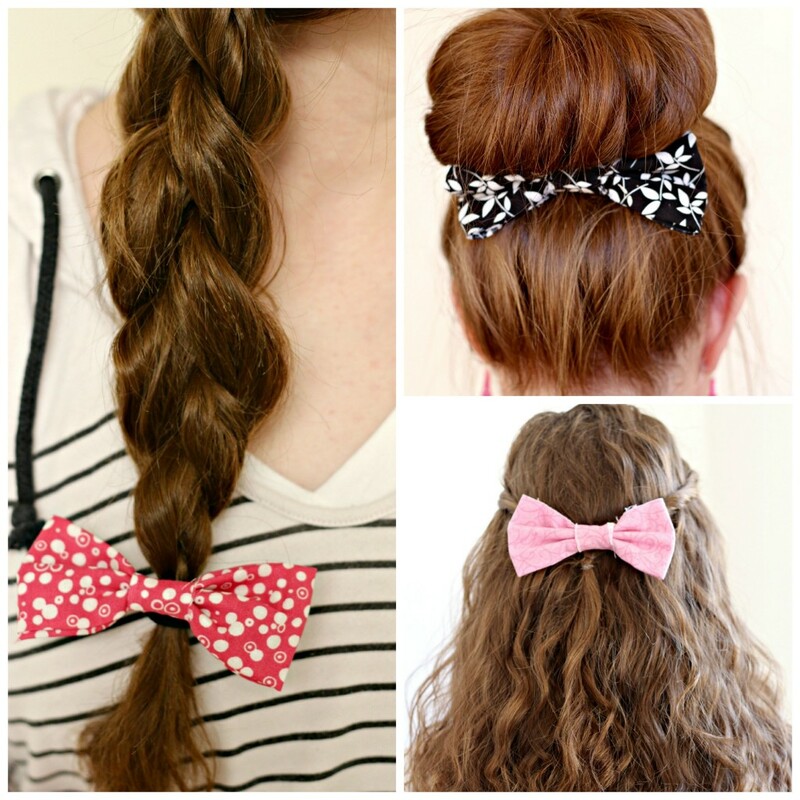 Here a some of the ways she wears them in her hair. Cute! I love them! She’s trying to decide on her project for next month. I’m excited to see what she comes up. Tell your cute daughter THANK YOU so much! 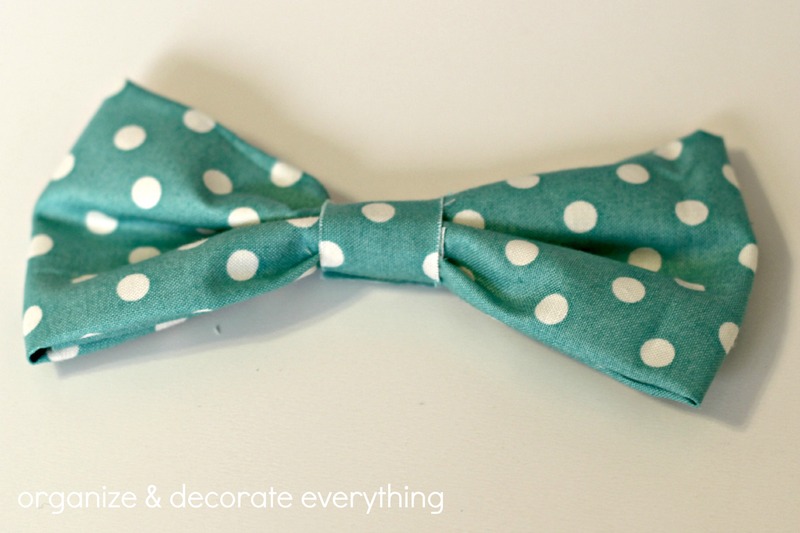 I have a quick and easy “no sew” bow, but this one is just as easy and WAY more cute. Darling. Will be doing this soon! These are so cute and I just love how easy they are to make – I think I will make a lot of these with my daughter! Very nice. I would like to make these to put in the shoe boxes at Christmas. Thanks for sharing. So cute~ I’ve got a little boy on the way. I saw these and thought how cute would it be to make him some little bow ties to dress up his outfits for church! I needed to make 42 bow ties for a musical. 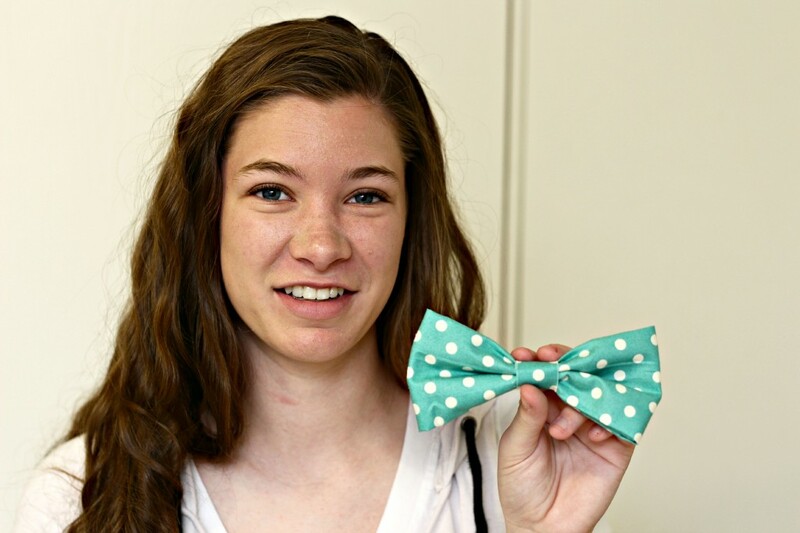 I searched all the no sew bow ties I could find. This one was the best! They were easy to make and once I got into a routine, they were done in no time. Thanks for the tutorial! Previous post: How Often Should You Wash Your Clothes?